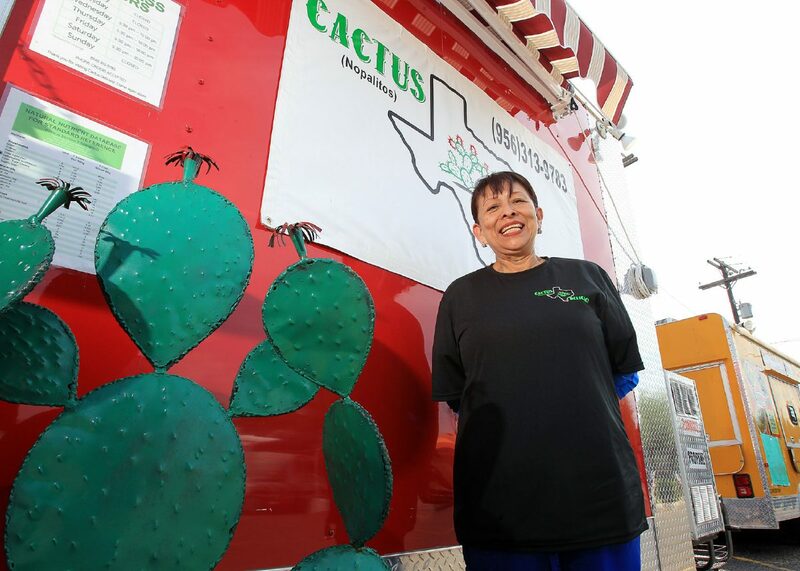 Hortencia “Tencha” Mata stands in front of her food truck, Cactus Delicacy, recently in McAllen. The McAllen Food Truck Park is home to numerous vendors specializing in diverse dishes — Venezuelan cuisine, ramen, traditional tacos and more. But one establishment differentiates itself by specializing in health-conscious cuisine. Hortencia “Tencha” Mata, 63, hurries to unfold tables and chairs afront her mobile restaurant, Cactus Delicacy. Her spot opens at 5:30 p.m. from Wednesday to Saturday, after she gets off work from her other job as a nurse. “A lot of people are attempting to do something about obesity — having surgeries and following a diet — but it’s so difficult here in the Valley with so many restaurants that introduce a lot of fat in their menus,” she said. Mata was inspired to open and serve nopalito (cactus) dishes because of the high number of diabetes cases in the Rio Grande Valley. She uses a technique to dry out the cactus first, to avoid its innate gooeyness. They are made to order using extra virgin olive oil. It was Mata’s mother who introduced her to cactus, and she admits she didn’t want to try nopalitos at first. After her mother died about eight years ago, she began to crave the taste. It took Mata about a year and a half to figure out the recipe, and her colleagues loved it when she’d take it to work. They started asking for their own bowls. Cactus is packed with vitamin B6, iron, calcium and amino acids, she said. “If you carried a diet with cactus in it, and cut down in oils and fat like I do, then you could probably even lose some weight,” said Mata, adding she’d still recommend exercise. Cactus Delicacy’s menu incorporates nopalitos into salads, dishes with ground beef, shrimp, chicken and fish. Their sides are white rice, black beans and air-fried chips. They sell water, small sports drinks, pomegranate juice and only two soda options. Mata said business is going OK, but not great. She does see a lot of repeat customers. A young, overweight woman approaches Mata asking if she sells tacos. She offers her fresh cactus tacos, but the woman says she has her heart set on the type of tacos she wants. She said she didn’t anticipate the amount of work it takes to run a food truck while working another job. Nopalitos were a staple to previous generations and she’s partly motivated to keep their traditions alive, she said of the nearly $60,000 investment made with partner George Arin. “It’s pricey, but it’s worth it,” Mata said. “I’d like to know that I can introduce health and nutrition out there to people who are willing to try it.